Do you listen to the cogs that whir in your head or the song of your heart that flutters in your chest? Teetering on the brink of absolute failure, love-sick Bobert discovers his heart to be more than he knew. From award-winning creator Candy Roberts comes a whimsical brew of physical comedy and conundrum. Like Ginger Rogers meets Mr. Bean on the Muppet Show, Ideas Bobert dances with the hilarious and the absurd. 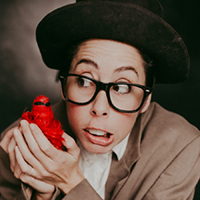 Candice Roberts puts on this one-person show reminiscent of the vaudevillian era, Chaplin-esque type of comedy where humour was simpler, more direct and ludicrous. Reading the program description first gives you a hint towards the underlying metaphor and a roadmap to what’s happening. Roberts executes the delivery expertly as she employs various media to evoke the senses. Cute and quaint, this visit into Bobert’s psyche leaves you giggling, sympathising and cringing through this entertaining and fun hour of discovery. If you don’t like being the centre of attention, it might be a good idea to avoid the front row.